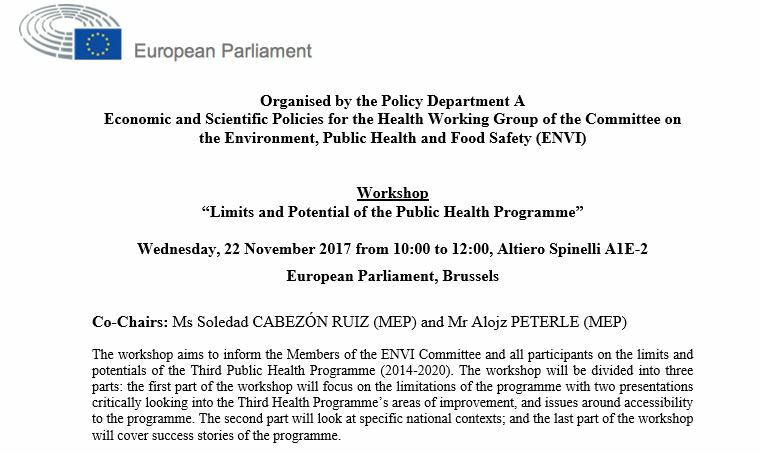 On 22 November, SUNFRAIL was presented in Brussels to members of the ENVI Committee of the European Parliament at the workshop “Limits and Potential of the Third Health Programme”. 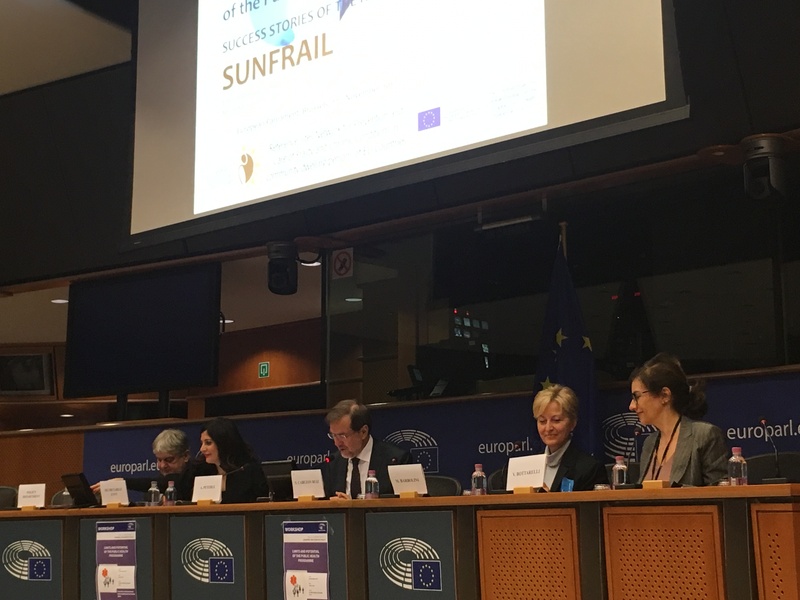 The SUNFRAIL Project was elected to present at the workshop as an example of a success story among projects funded by the Third Health Programme. The project and its results were presented by the project coordinator, Mirca Barbolini for the Emilia-Romagna Regional Health and Social Agency. The workshop objective was to reflect upon the limits and potentials of the EU Health Programme, presenting national prospects and examples of successful planning, in preparation for the negotiations on the next European financial programming post-2020. MEPs Cabezon Ruiz (S & D) and Peterle (EPP) stressed the key role of the EU Health Programme in promoting inclusive growth in Europe, which they are hoping to be continued in the next financial framework. Current and future challenges of the health sector are many and have important economic and social impacts: universal access to health, the quality of social and health systems and the efficiency of public spending. Health issues must therefore remain a priority in the EU and find its right place in terms of policies and programmes. The EU Health Programme, of small size from a budgetary point of view, remains crucial in defining the EU’s political framework and as such will be supported by the European Parliament. Irene Athanassoudis (DG SANTE, European Commission) and Donata Meroni (Chafea) presented the results of the Health Programme’s mid-term evaluation conducted by external experts and the public consultation launched by the European Commission. The fundamental aspect that emerged in these documents is the European added value of the programme, the validity of selected thematic priorities, the positive synergies between the EU Health Strategy and the related programme. Criteria in the selection of strategic projects that will need to be worked on in the future are: cross-border assistance, improving project-scale economics, exchange of good practices and networking. The SUNFRAIL project, represents a good practice in this regard to continue building in the future. SUNFRAIL sees the participation of 11 partners – including 9 Reference Sites – from 6 EU Member States. Mirca Barbolini presented the project focus: to improve identification, prevention and management of frailty and multimorbidity in people over the age of 65. Through the currently ongoing activities of SUNFRAIL, it has been possible to develop a model for verifying the adaptability and replicability of good practices in this field in different health systems and socio-cultural contexts. Mirca Barbolini also presented the “SUNFRAIL Tool”, including nine questions selected from evidence-based tools already adopted in health services in the EU and in the US, to identify frailty according to the bio-(physical), psycho (cognitive and psychological) and social domains. The project Final Conference will take place in Bologna on 7 February 2018.